Curbside Recycling: Waste Resource or Waste of Resources? In this paper, we address the often contentious debate over state and local recycling policy by carefully estimating the social net benefit of curbside recycling. Benefits are estimated using household survey data from over 4,000 households across 40 western U.S. cities. We calibrate household willingness-to-pay for hypothetical bias using an innovative experimental design that contrasts stated and revealed preferences. Cost estimates are compiled from previous studies by the U.S. Environmental Protection Agency and the Institute for Local Self Reliance, and from in-depth interviews with recycling coordinators in our sampled cities. Across our sample of cities, we find that the estimated mean social net benefit of curbside recycling is almost exactly zero. On a city-by-city basis, however, our social net-benefit analysis often makes clear predictions about whether a curbside recycling program is an efficient use of resources. Surprisingly, several existing curbside recycling programs in our sample are inefficient. Aadland, David M., and Arthur J. Caplan. 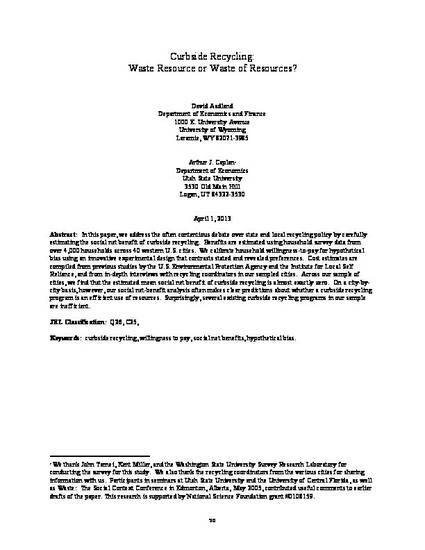 (2006) "Curbside Recycling: Waste Resource or Waste of Resources?" Journal of Policy Analysis and Management, 25(4), 855-874.